The size of both instruments is the same but the tuning, number of the tones and the width of the plates are different. Deeper tones of the seven pentatonically tuned plates, the vibrations are felt strongly in the hands. That's why B7 is especially favoured by therapists. The sound of the instrument can be further amplified by putting it on a tabletop or on the skin of a drum. 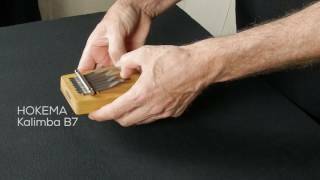 The tuning of the Kalimba B7 is pentatonic C. That's why it always sounds in harmony and even the beginners can enjoy very quickly.